Go from two wheels to four. Passengers will load from the curbside of the bus only. Squeeze the rack’s metal handle to release the latch and lower the rack. Lift the bicycle onto the rack, fitting the wheels into the slots labeled “Front” and “Rear”. If the rack is empty, use the slot closest to you. Secure the support arm and place it over the front tire, not on the frame or fender. Passengers will unload from the curbside of the bus only. As the bus approaches the stop, inform the driver that you need to unload your bicycle. Raise Passengers will unload from the curbside of the bus only. As the bus approaches the stop, inform the driver that you need to unload your bicycle. Fold the rack back to its upright position, if there is no other bicycle on the rack. Passengers are responsible for loading/unloading bicycles in a timely manner. Operators are not able to leave the bus to assist with the loading or unloading of bicycles. Bikes are loaded on the bus at passengers own risk. 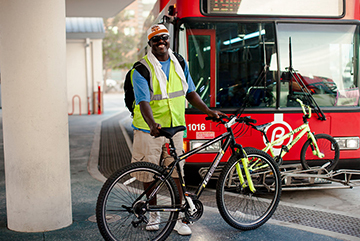 CCRTA is not responsible for injuries and/or damages incurred to bicycles, personal property or passengers while using the racks or riding the bus. CCRTA assumes no liability for stolen property. Bicycle racks can carry two bicycles at a time and are available on a first come, first serve basis. If the rack is full, the passenger will need to wait for the next bus. (Bicycles are not allowed inside of the bus.)  Bicycles may not be locked to the rack. Tricycles, mopeds, tandems, and recumbents are not permitted. These items do not fit safely into the racks. Cycles fueled by gasoline or any other flammable materials are prohibited. All willing and able passengers are permitted to use the racks. Children age twelve (12) and younger may use the rack when accompanied by an adult. 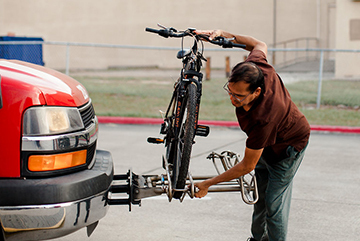 Use caution when stepping off the curb to load and/or unload your bike from the bus. Wait for the bus to leave before you cross the street. Be patient while others load or remove bikes on the bus rack. Before the bus arrives at the stop, remove any loose objects or personal items that could fall off of your bicycle in transit. When loading or unloading your bicycle, maintain as much eye contact with the driver as possible. No additional fare is charged to use the bicycle rack and no permit is needed. Bicycles that are not unloaded by their owner will be brought back to the CCRTA facility at 5658 Bear Lane. Passengers can retrieve their bicycle by contacting the CCRTA Information Center at 361.883.2287. The bicycles will be held at CCRTA for thirty (30) days. If the owner does not claim the bicycle within thirty days, the bicycle will be donated to a local charity. CCRTA is not responsible for personal injury, property damage or property loss of riding equipment. Use at your own risk. All our buses are equipped with bike racks for our rider convenience Monday through Sunday.